The protracted negotiation between the government and the workers' representatives saved the day with economic losses averted to the relief of Nigerians. The Nigeria Labour Congress (NLC) and the Federal Government yesterday succeeded in averting what could have been a complete lockdown of the economy over the disagreement on minimum wage for workers. The protracted negotiation between the government and the workers’ representatives saved the day, leading to the suspension of a nationwide strike that would have begun at midnight today. At 10.30 p.m, there were unconfirmed reports that airport workers union had already announced stoppage of international flights. 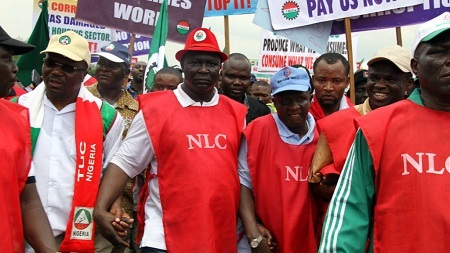 Led by the NLC President Ayuba Wabba, the organized Labour had insisted on a N30,000 minimum wage workers in the country as against government’s N24,000. But Ayuba last night announced a suspension of the proposed action after the workers got what looked like a concession from the government team led by the Secretary to the Government of the Federation (SGF), Boss Mustapha. Although Wabba could not divulge the agreed amount, he said the work of the tripartite committee had been concluded and that the report would be submitted to President Muhammadu Buhari at 4.15 pm today (Tuesday). Asked to disclose the amount agreed upon by the tripartite committee, Wabba said: “The figure will be released when we submit the report tomorrow (today). Nigerians yesterday were caught up in panic buying as they anticipated the industrial action by the organised labour. In Ibadan, residents swooped on markets to purchase food and other essential items. At Bodija market, a civil servant, Mary Okoisi, told The Guardian she was ready for the strike, as she had stocked up enough food. The organised labour yesterday held a prolonged meeting at Mustapha’s office. But as at 10:00 p.m., there had been no consensus on the contentious N30,000 minimum wage demanded by the workers’ unions. At a point, the governor of Kebbi State, Bagudu Abubakar, who was the sole governor that attended the meeting, stormed out at exactly 7.42 p.m., declining to speak to reporters. The Minister of Labour and Employment, Chris Ngige, said the invitation extended to the state governors was a mere opportunity to be a part of the negotiation process and not to influence proceedings. The Guardian learnt that the organised labour insisted on obtaining a definite date for the submission of the report to President Buhari before suspending the strike. Mustapha explained that the president had closed for the day and had gone home. He added that the president might likely come down-stairs later in the evening. This necessitated a two-hour adjournment.